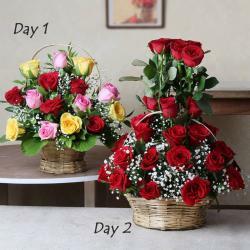 Product Consist: Day1: Bunch of 6 Orchid with 2 bars of Dairy Milk Silk Chocolate (Weight: 60 Gm each):: Day 2: Bunch of 10 Red Carnation with 16 pcs Ferrero Rocher Chocolate box:: Day3 : Bunch of 10 Mix Roses and Gerberas with Cadbury Celebration Chocolate Box (Weight: 141 Gm ):: Day4: Bunch 10 Mix Colours Gerberas:: Day5: Bunch of 10 Mixed Colour Roses with cute teddy bear (6 inches):: Day6: Bunch of Ten Red Roses and 1/2 Kg Round Chocolate cake with 2 Bars of Fruit N nut Chocolates (Weight: 35 Gm Each). When the occasion is of six days, it will not be justifiable to gift your special once. 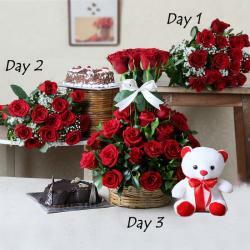 Send these six days serenades to your love and give her a reason to smile every day. 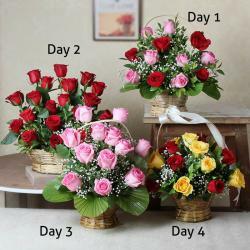 Pick this awesome 6 day serenade for your loved ones for a consecutive delivery of four days in a row. Flowers have an innate charm and can bewilder anyone. This bouquet of flowers should definitely make it to your list of necessary gifts for special occasions. This serenade contains Flowers, Cake, Chocolate and Teddy Bear which look really Memorable and tempting in Seven days consecutively gifts. There is a matching ribbon bow tied into the entire ensemble for added effect as well. Give this combo to your dear ones on special occasion such as Birthday, Anniversary, Good Luck Gifts, Gudi Padwa / Ugadi, Valentine's Day and bring a smile on their face. 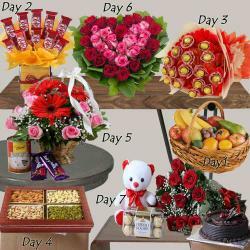 Send this bountiful Serenades hamper from Giftacrossindia.com and make your recipient feel special. Product Includes: Day1: Bunch of 6 Orchid with 2 bars of Dairy Milk Silk Chocolate (Weight: 60 Gm each):: Day 2: Bunch of 10 Red Carnation with 16 pcs Ferrero Rocher Chocolate box:: Day3 : Bunch of 10 Mix Roses and Gerberas with Cadbury Celebration Chocolate Box (Weight: 141 Gm ):: Day4: Bunch 10 Mix Colours Gerberas:: Day5: Bunch of 10 Mixed Colour Roses with cute teddy bear (6 inches):: Day6: Bunch of Ten Red Roses and 1/2 Kg Round Chocolate cake with 2 Bars of Fruit N nut Chocolates (Weight: 35 Gm Each).